I can’t believe it’s only been two weeks since I was in Dublin, attending the World of Coffee Event. As I pointed out in my round-up last week, I’d never been to World of Coffee before, so I didn’t know what to expect. As it turned out, I really liked it. A cross between the London Coffee Festival and Caffè Culture, it incorporated the best of both events and, as is always the case, there was far too much to for me to see, even though I was there on all three days. I spent a lot of my time at The Village, catching up with various European roasters, which I’ll cover in detail next week. The rest of the time, when I wasn’t bumping into people I knew, I had a look at some of the kit on offer, which is what I’ll talk about this week. The automatic filter coffee crowd was out in force, but having spent a lot of time with them at the London Coffee Festival, I gave them a miss this time around. Instead, I caught up with a couple of espresso machine manufacturers and a manual method that was new to me. All the major espresso machine manufacturers were out in force, with perhaps the exception of Kees van der Westen. However, La Marzocco, Nuova Simonelli/Victoria Arduino and Sanremo were all there, each with a huge stand, as well Slayer, all the way from Seattle, while Synesso was one of the event sponsors. There were also a couple of smaller names that I didn’t recognise, plus the two stands I did spend some time on, Faema and Conti. I’d rather ignored the espresso machine manufacturers at the London Coffee Festival, instead spending my time with the new crop of automatic filter machines, so this seemed like a good chance to make amends. That I ended up on the Faema and Conti stands rather than anywhere else was down more to random chance than any firm planning on my behalf. Starting with Faema, I’ve long been a fan of the classic E61, which some describe as the first modern pump-based espresso machine. I’d therefore been quite excited to see the launch of the new E71 at the London Coffee Festival, but the stand was so busy there, I couldn’t get near it. So, when I saw my chance at the World of Coffee, I took it! I’ll leave the sales pitch to Faema itself, while the gallery has more information on the E71’s various features. It seems to be to be very much in-line with modern trends in high-end, high-performance espresso machines. There’s an emphasis on volumetrics (the ability to control the precise volume of water delivered), temperature stability and programmability/control. At the heart of the E71 is a touch screen which enables you to program almost every aspect of the machine. For example, I was being given a tour of a three-group machine. Each group head is individually programmable, with a separate boiler temperature for each. Each group head also has four individual buttons, each programmable with a different set of parameters and, if that wasn’t enough, you can also manually control each group head with a small lever at the top, which acts like an on/off paddle. The other machine I got a good look at was Conti’s 60th anniversary machine. This was more down to it being manned by an old friend of the Coffee Spot, Dhan Tamang, who has been UK Latte Art Champion for about as long as I’ve been writing the Coffee Spot. I’ll be honest, my desire to take a look at the Conti had as much to do with wanting to see Dhan practicing his latte-art magic than anything else. However, the Conti, which isn’t a name that’s often mentioned in speciality coffee circles, was a fine-looking beast, particularly the one that Dhan was on, with its prominent levers. It had been produced to mark Conti’s 60th anniversary and is, I believe, a proof-of-concept machine, rather than a full production model, and is based on Conti’s new Monte Carlo range. World of Coffee was a good chance to catch up with Justin from Cafflano, who I’d met at the London Coffee Festival. As well as demonstrating the Cafflano Klassic and the new Kompact, Justin had also given a Klassic to Jess (of EatingEast fame) for her article in the latest Caffeine Magazine on making coffee outdoors. So it was also an opportunity to say thank you to Justin and also to let him know that the article was out. Justin had some good news while I was there: the Kompact had just won the World of Coffee’s Best New Product Award! He was also able to tell me of some exciting new developments, such as an idea he has had for a hotel in Korea, where there’s a Cafflano Klassic in every room, along with some sample packs of beans from various roasters. Now that’s an idea worth having: simultaneously providing better coffee in hotels, and the amount of stuff I have to pack… He also told me about an exciting idea for a Cafflano café, but that can wait for another time. Next stop was a chance encounter with Acme Cups, which had come all the way from New Zealand to exhibit (along with local distributor, Caravan). For those who don’t know why this is so exciting, the Coffee Spot Cup, which I use as my logo, is an Acme Cup, a kind gift from Caravan. 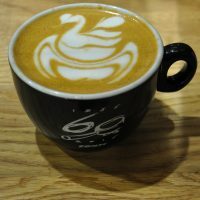 So, I finally got to meet the makers of the Coffee Spot Cup! Finally, there was another chance encounter, this time with Espro, which had a stand right at the back of The Village (where all the roasters were). Espro is a Canadian company which makes various products. However, the one I was interested in is the Travel Press, basically an advanced cafetiere. Now, I’ll confess, I was initially more than a little sceptical. First of all, does the world really need another cafetiere? What’s wrong with the existing design? Secondly, the USP of the Travel Press is that it keeps your coffee warm for up to four hours and you can drink straight from the Travel Press itself. Those that know me well will realise that this is not a USP that appeals to me. If I really want to, I can (and have) make my coffee in my cafetiere, stick it in a vacuum flask and when I want to drink it, pour it into a cup. I mean, it’s not as if I don’t have plenty of those! However, I am nothing if not fair, so I had a conversation with the nice man at the Espro stand which resulting in him giving me a Travel Press to take on my travels with me. Our joint reasoning was that if it was as good as he said it was, it would win me over. Plus, since I was heading straight from Dublin to nine days in Copenhagen, it would be the perfect opportunity to put it to the test. You can see what I made of it after the gallery. Let’s start with a rundown of the Travel Press itself. For starters, it’s made of steel, so is practically unbreakable. One of the reasons I stopped taking a (glass) cafetiere with me on my travels was that I was tired of breaking them no matter how carefully they were packed. Its other big positive is that it has a double micro-filter system so it almost completely cuts out the residue that you normally get with a cafetiere. So far, so good: an unbreakable, superior cafetiere! Another benefit is that it’s thermally insulated, so once you’ve made your coffee, you can screw on the lid, throw it in your bag and off you go. It’s spill-proof and will keep your coffee warm for at least four hours. Then, when you’re ready, just unscrew the lid and drink straight from the Travel Press. This, I confess, was less appealing since I’ve never been much for drinking coffee on the go. If it’s worth drinking, it’s worth taking the time to stop and drink it properly. In use the Travel Press is much like a cafetiere, with the same grind and the same ratios. It holds 300ml and there’s a handy line at the 300ml mark which is pretty accurate, handy if you don’t have any scales. Simply put the ground coffee in, pour in the water and then put the top on. This comes in two parts, one which holds the plunger/filter and screws onto the top of the Travel Press and the other which is the lid. This screws onto the first part (but only after plunging). This is what keeps the coffee warm and stops it spilling. However, the Travel Press really came into its own when I got to Copenhagen. I was working in a conference room in a hotel for five days and the coffee was, to put it bluntly, terrible. Suddenly, this idea of making my coffee ahead of time became appealing. The next morning, I made a Travel Press, screwed on the top and threw it in my rucksack (well, carefully placed it, actually). Come the first coffee break, out came my Travel Press. I poured half the coffee into a cup, drank it and thought it was pretty good. Second coffee break, out came the other half. Still pretty good. Unsurprisingly, this became my daily ritual. So, consider me converted. I like my Travel Press, it’s easy to use, practical and it makes good coffee. Can Espro have it back? Absolutely not! Will I take it with me on every trip? Probably not, but I’ll say this: I do like cafetiere coffee in the morning, far more than I like Aeropress coffee, so I can see my Travel Press becoming a regular companion on business trips or when I know I’ll be staying in hotels with bad coffee at breakfast. Then it will turn into a lifesaver! I also recently tried the Travel Press as a solution to the airline coffee problem. See how I got on with it as I flew to Hong Kong! Don’t forget to check back next week to meet all the roasters I caught up with at World of Coffee. This entry was posted in Coffee Kit, Dublin, Festivals/Awards by Brian Williams. Bookmark the permalink.